Straw Bale Gardening is the latest trend in gardening for growing beautiful veggies, herbs and flowers without using traditional soil. Argyle Feed & Hardware has all the supplies you need to start your own straw bale garden project: straw bales, conventional and organic fertilizers, soaker hoses, trellis hardware and, most importantly, high quality vegetable and bedding flowers from Bonnie Plants as well as seed products. To get started, you’ll spend a couple of weeks preparing the bales (conditioning them), which really involves feeding and watering the naturally occurring bacteria inside the bales, in order to get them to multiply quickly and colonize the bale. Once bacteria have saturated the bales, they begin to consume the straw itself, digesting it, decomposing it, and deconstructing the cells that created the oat or wheat plant. The cells break down through this process and return to their original state as nutrient molecules. The bacteria are manufacturing “soil” and while this very new soil won’t exactly look like soil that might be familiar right away, biologically, it will be very early stage soil and will supply all of the necessary nutrients required by roots of the plants that will quickly fill up the interior of the bales. 1. The bales are warm inside. As the bacteria decomposes the straw it generates a great deal of heat, and this heat inside the bales is very beneficial for the newly germinating seedlings, developing roots inside the bale. 2. There are no weeds. While straw bales may have a few left over seeds inside them left behind by the harvesting equipment, these are the only “weed” seeds the bales contain. During the two week conditioning period the bales often get very warm and this heat renders inert most of the leftover seeds that may be present. Traditional soil is filled with weed seeds, some of which can harbor in the soil for 15 or more years prior to germinating and sprouting a new weed in the garden. It is virtually impossible to ever rid a soil garden of weed seeds; they just keep growing, which means the gardener stays busy pulling these weeds all summer. Straw Bale Gardeners have very few, if any, weeds to worry about. 3. Straw bales provide “raised beds” naturally. This raised height is really terrific if the gardener has any physical limitations or can’t bend over or get down on the ground. Seasoned gardeners may get to the point where soil gardening and the hard labor usually required to prepare, plant and care for that soil garden can become a limiting factor. If it feels like the only option is to give up gardening, don’t close down the vegetable factory just yet. 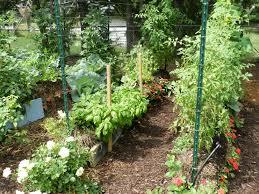 Instead try a Straw Bale Garden… you’ll wish you had discovered it many years ago! 4. Straw holds moisture really well. Farmers have used straw for thousands of years to bed their livestock. The long narrow hollow tubes of straw stalks fill up with water quickly due to a principle of physics called adhesion, a natural physical attraction of water droplets to charged solid surfaces. The tubes of straw filled with water can be picked up and transported to the field where the farmer spreads the dirty and wet straw as manure and tills it into the soil for the nutrients. A straw bale will hold three to six gallons of water inside, so our plant roots have a steady supply of moisture available throughout the summer. 5. Straw can’t be overwatered. OK, so in #4, it says straw retains moisture really well… but at the same time it is impossible to flood a straw bale, so even if a 5” rain comes along the day before you planned to plant your garden, it won’t matter. Once the bale is soaked it won’t hold any additional moisture, and the water just runs through and out the bottom. When the traditional soil gardeners are complaining about it being too wet to plant, you’ll be planting in the rain, without any difficulties at all. Muddy feet will be your only problem when you plant in the rain. 6. Say goodbye to insects. Fewer insect problems occur in a Straw Bale Garden for a couple of reasons. Insects often like to harbor over winter in larval, pupal or adult stages down in the traditional soil profile. Inside a Straw Bale Garden, new soil is created annually and, inside this bale of brand new soil, there is no chance that any insects could have harbored over winter. The other reason fewer insect issues occur is the encouragement to use very tall horizontal posts and a wire trellis system above the bales. The foliage of many of the vegetable plants will climb up the tall trellis which allows much better air circulation around the leaves. This air circulation keeps the leaves dry, which is not desirable for insects. Bugs tend to like a humid and moist environment to lay eggs and reproduce. This cultural change tends to reduce the number of insects and reduce the damage they inflict when they are present. 7. Diseases are a thing of the past. There are fewer disease problems when gardening in straw bales for a number of reasons. One is that there are fewer insects, and insects tend to pick up spores of many fungal diseases and distribute those spores onto other plant leaves throughout a traditional garden. The dry foliage, the result of the recommended trellis system, also helps stop the propagation of fungal spores on leaves. Keeping the leaves of vegetable plants dry can also be accomplished by using ONLY a soaker hose or drip-style irrigation system. By never getting the leaves wet but instead just applying water directly above the roots will create a cultural change in the garden that will also help to reduce or eliminate disease issues in your Straw Bale Garden. 8. Growing in bales lowers your cost. First, we need to all agree that the most expensive component to growing a vegetable garden is LABOR. Your labor to pull weeds all summer, for hours at a time, just to keep up with the incredible growth, costs time and energy. If you ever had to actually pay someone, or pay yourself, you’d have to agree that labor is the biggest expense in a traditional soil garden. Straw Bale Gardening eliminates weeding and thus eliminates this huge expense, allowing you to spend your time doing something far more productive and more fun than pulling weeds all summer long. 9. Bales, bales, everywhere. Argyle Feed has an ample supply of straw bales to get your garden growing! 10. Crazy good leftovers. Straw Bale Gardening generates lots of beautiful compost. When you start with ten bales, for example, you end up with about three or four bales of beautifully broken down and decomposed compost at the end of the year. It is very clean, extremely “root friendly,” weed free and holds moisture really well. Use this compost as mulch around perennials, or to fill window boxes and planters, or just spread it over the soil in your other garden areas and work it into the soil. This beautiful compost will improve any and all traditional garden soils. Or better yet, use it to make your own bales next year! So there you have it, the top ten reasons that a Straw Bale Garden is better than a traditional soil garden. To find even more reasons to start a straw bale garden, check out www.StrawBaleGardens.com, www.Facebook.com/LearnToGrowAStrawBaleGarden. And, of course, come see us at Argyle Feed & Hardware for expert advice and supplies for getting started with your Straw Bale Garden. You may discover, like so many others have already, that this gardening method is changing lives. This entry was posted on Wednesday, April 6th, 2016 at 3:56 pm	and is filed under Garden, News & Updates. You can follow any responses to this entry through the RSS 2.0 feed. Both comments and pings are currently closed.